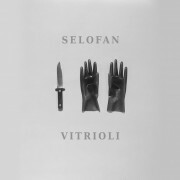 With 4 acclaimed studio albums already under their belt, the Athens-based synth / coldwave duo Selofan announces “Vitrioli”, their fifth and most staggering album yet. A well-known purveyor of allusive, synth-infused coldwave music and the driving force behind the Greek label, Fabrika Records, Selofan followed the siren call of the 80’s goth sounds and minimalism, carving out their own spot at the forefront of independent wave music scene. The seasoned hunters constantly digging for new dramas and passions to grace their visual intention and musical charm, the band specialize in deep, cold and racy analog sounds- but have always been favored along with howling vocals, well-distilled synths and heartbroken sax- when it comes to the occasional shootout between genre trenches. Across “Vitrioli”s eleven heart-wrenching love songs and odes to the failures and hysterias of the subculture, Selofan brilliantly express the band’s main themes they’ve been exploring since their existence: that there is dark humor in emotional vulnerability, that one can find a way to laugh and cry in the same breath – and get stronger. The sound of “Vitrioli” is intense, inflammatory and sometimes harrowing- the record taps into the depths of madness: chanelling a lover’s call to arms, power of self-awareness and brutal rawness of desperation, love and hate conflict colliding into devastating effects. Famously provocative, Selofan create an unpopulated dramatic realm where sad lovers shapeshift into a destructive, obsessive, ambitious persona with a driven desire. Short Biography Selofan is based in Athens/Greece. Joanna and Dimitris record since 2011 their analog stories at home, their sound can not really be identified as they mix many different music genres and languages in order to express deeply emotional, fatalistic music. They often use poetry in different languages and have a unique live power, being very theatrical in their shows. They played concerts and festivals around the world and belong among the protagonists of Fabrika records. Blablarism is Oksana Zmorovytch from Kiev.She creates a music elixir based on shoegazy ghosts and drone labyrinths. This is her first full LP and contains some older songs blended with new ethereal stories. The fact that she is from Kiev, affects her music, adding endless landscapes of grey, tradition blended with New Modern Ways and intriguing mythology. There is something mystical about Blablarism’s music. 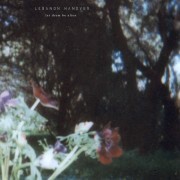 It sometimes appears as common as an old shoegaze record you have played one millions times on your teenage room, then suddenly turns to a cold wave anthem with incomprehensible almost pagan vocals and gloomy, fustian synths. Blablarism can also be described as experimental electronica, although the synthesis is somehow wisely structured and moderated with caution. The stories on this album are all like a personal diary written, not with words but with noises. And this private pieces of her are accompanied with romantic visuals and associative aesthetics in order to guide you into her heart. The LP will be released in 500 hand numbered, limited copies. M!R!M begun as a duet in 2011 and created a huge buzz around their name instantly. Today M!R!M is a 23 year old boy, named Lacopo Bertelli. His music was generously tagged as “post punk”, however the layers of it make any categorization, a difficult matter. Bertelli, created “Heaven” in his bedroom, trapped inside four walls of loneliness and fear of what the future may bring. Haunted by the Jesus and Mary Chains’ dirty guitar sounds, the New M!R!M keeps the powerful, dynamics of their older work intact, but upgrades it, adding the most essential ingredient in creating good music: The Passion. “Heaven” is literally Bertelli’s personal hell, and all his songs seem to feed on his subconscious, creating a doomed, vulgar, acid world with whispers that become screams and guitar effects blend with inner voices and synths. You will be surprised many times, listening to “Heaven”. You might find traces of SUICIDE’s frenzy, WIRE’s straight forwardness and DNA’s nihilism.You might as well be surprised by the noir wave duet with Nathalie Bruno (from the promising band, PHOSPHOR), one of the highlights of the LP. 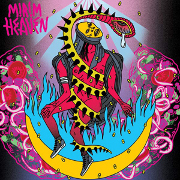 M!R!M’s “Heaven” is definitely worth the wait of those who already new the band and a great introduction to all of those who search for a dirty, violently personal sound. 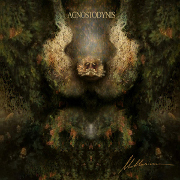 The Cover is made by contemporary artist, Zigendemonic. The LP will be released in 500,hand numbered, limited copies. Being involved in various avant garde/new wave music projects since 1996, intrigued by the all analogue mentality of the late 70′s-early 80′s music field, he passionately committed to vintage synths and machines, creating a very distinctive and specific style and considered by many as “specialist”. His live performances are all analogue by choice and are interestingly captivating as the sound is being built on stage,just like the old days. We proudly introduced him as a unit to the world, with a brilliant and unique self title 7” (Feb/2013) that was an instant sold out. Therefore the next step of a full LP seemed inevitable and needed. ”Over Mentality” is a record, full of Minimal Electro perfectionism and New Wave complex landscapes, performed with the agility and passion of a natural born Purist. 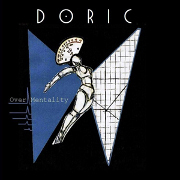 Doric’s mentality, carries raw, passionate, old school values filtered with the innovation of a musician that is cursed to live Today. His subjects vary from unexpected loves, cursed lives, wasted, devoured dreams however, all of them cling under one thematic area: How memories fulfill us and keep us sane. The artwork of the record implies the handmade, old school ethos as well. The LP will be released in 500, hand numbered, limited, black vinyl copies.